NuLu is full is new restaurants, shops, bars and coffee shops. Among all of those new businesses is one of Louisville's oldest family owned businesses, Muth's Candies. Established in 1921, Muth's Candies has always been located downtown on the 500 block, but they relocated in the 60's when their original shop was replaced by the expressway. When you walk into the candy store it's like taking a step back in time. There are antiques that line one entire part of the store that are so fun to look at. While talking to one of the family members I learned that these pieces were mostly antiques from other family members who had passed away. This included engraved beer mugs and roses folded out of paper. The other side of the shop features all of the candies that are made daily in the store. What I found fascinating is that the cases that store the candy were bought second-hand in 1921 when the shop first opened, so they are now over 100 years old. As you browse the cases of candy you will see every kind of candy you could ever imagine. There are chocolate covered raisins and peanuts, caramels, fudge, bourbon balls and their signatures candies, modjeskas, which are named after one of the family's favorite Polish actresses. The modjeskas are mashmallows that are covered in caramel. Not only was I impressed with the delicious candies, but the family who owns the store could have have been more friendly. They were so excited to tell the history of the store and get to know me while I was shopping. One of the uncle's who works in the store told us as we were leaving, "Don't keep us a secret! Tell all your friends, family and neighbors about us!" After tasting their melt-in-your-mouth candies, I will be doing just that. 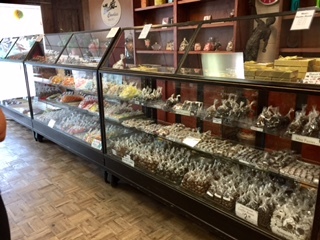 Go take a step back in time and check out Muth's Candies for yourself!